My doorbell just rang. It was the first time since moving here that I heard only my doorbell ring when someone was at the door. And my heart broke all over again. This morning at about 10 am, Mister Soandso and I euthanized our beloved Charlie…the brown streak of energy and love that has been such a part of our lives, family, and home for the past nearly ten years. And when the doorbell rang, he didn’t go running and barking to the door. Charlie collapsed last Thursday night and when I was writing “Focus On What Lasts” I wrote about my kids and what can seem frustrating about parenting. But what I really wanted to write, the words that filled my heart, was more like a stream of pleasedon’tletCharliehaveabraintumorpleasedon’tletCharliedie. But I wasn’t ready to share yet, and I was still waiting on the phone call from the vet, so I wrote about other stuff I was thinking about. Later we got the news that while Charlie didn’t have a brain tumor, he did have tumors on his spleen and liver, and was bleeding internally. It isn’t the sort of thing a person can fix, regardless of how much love or money is available. So we brought Charlie home with a whole bunch of palliative care medicines and the determination to give him the best last weekend he could want. His discharge notes were clear – let him eat anything he wanted, let him sleep on all the furniture, and give him as many loving gifts as we could. Starting then, I began taking as many photos of him as possible. Trying, in some small way, to hold onto him as long as I could. To capture as many moments left with him as we had. Last weekend was a glorious, sunny one. Charlie was able to go out in the sun a whole bunch, and roll around in the grass with that big ole smile on his face. He ate an entire rotisserie chicken, skin and all. He took a nap on the couch with the Mister. And last night he brought out his old nasty bone and no one complained about his slobbers when they threw it for him, again and again. Last night, Mister Soandso slept on the floor with him and the last thing he did was go for a car ride and catch his frisbee several times out in a grassy field. We tried to give him as many loving gifts as we could. But the truth is, he gave us so many more gifts than we ever gave him. He was our Christmas present in 2005. And he changed our family for the better. I didn’t know it then, but I took my last walk with him last Wednesday. And the photo I wish I had, but that I didn’t know to take, was Charlie doing what he usually did when he and I went for a walk or a run. He paused and looked up at me, checking that I was doing okay. And I patted his head, told him again he was a good dog; then he turned his nose back into the wind and the walk he loved taking. The last time I took him out on Sunday, he stood on our hill and looked out into the field. Maybe he was looking for his nemesis, the neighbor’s cat. Maybe he was making sure the coyote wasn’t out. Maybe he was checking for the crow and red winged black bird that fly around our home nearly every day. Maybe he was checking, one last time, that all was safe for his family. Or maybe he was making peace with leaving this place and getting himself ready to cross the Rainbow Bridge. I don’t know, but those are the ways I will remember him: happy and regal, a beautiful furry member of our family who is a part of some of my favorite memories. It rained hard last night and he woke from the thunder that scared him. It was still raining hard this morning – great big rain drops as if the heaven’s knew how sad the Mister, the kids, and I all felt. And it was raining again by 10:30. But for a short window of time, Charlie’s last time here with us, it wasn’t raining. And he was able to run and catch that frisbee the way he so loved. You will be missed Charlie Brown Dog, but you will never be forgotten. And we’ll see you on the other side. We’ll bring the frisbee, and you bring your big smile and kisses. Many thanks to Dr. David Slocum, DVM of Hazel Dell Animal Hospital, and Dr. Heather Poncelow, DVM of Columbia River Veterinary Specialists for their compassionate care of Charlie. 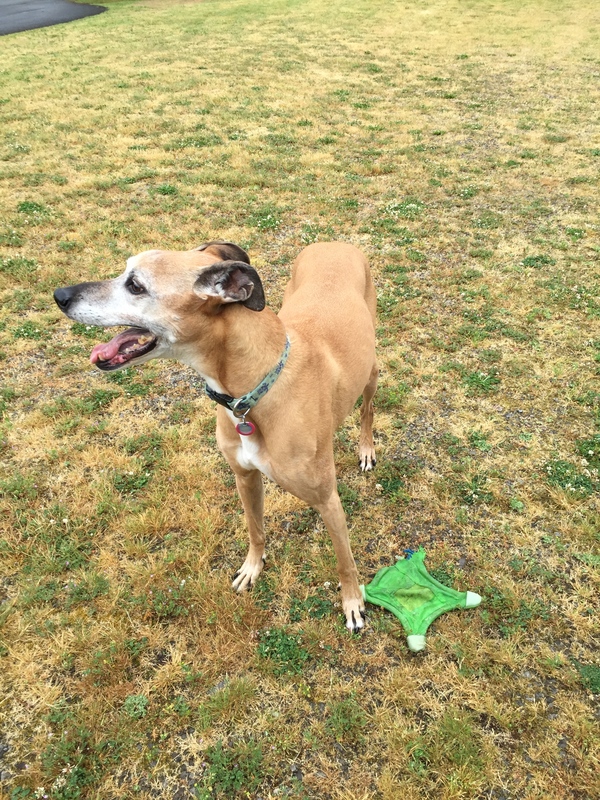 This entry was posted in family, Front Page, pet ownership, poetry and tagged dogs, greyhound-boxer mixed breed, grief, the death of a pet by kristina. Bookmark the permalink. I’m so sorry, Kristina. I know how you feel. We had to do the same with our kitty just a month ago. The Dark Poodle of the Apocalypse is 15 and has her own health issues as well. We do so love our little furry friends. It’s hard to let them go. It’s the quiet that hurts. Right? And for right now, I can’t stop remembering those last few moments as he stopped being Charlie. I know it was the right thing – to let him go without pain. But this moment right now hurts so very much. It will get better. But for now, I just miss him and his noisy self so much. I’ve been thinking of you of and on all day. So, so sorry for you and the whole family. I’m so very sorry about Charlie. Hugs and prayers for you and your family. I’m so sorry to hear about Charlie. He was a great dog, and a part of the fam. It is hard to let pets go, no matter the situation. We love and miss you and Mister Soandso.